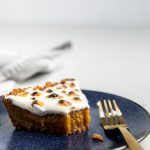 THIS DAIRY FREE SWEET POTATO PIE RECIPE IS SO DELICIOUS, YOU’D NEVER EVEN KNOW IT’S A VEGAN SWEET POTATO PIE RECIPE! IT’S DAIRY FREE, EGG FREE, AND HAS A GLUTEN FREE OPTION! Desserts. It’s one of the main reasons that you are going to your family’s holiday function. Dessert upon dessert upon dessert, has you in the holiday spirit if nothing else does. We won’t blame you if you skip the main course and head straight to the dessert buffet either. However, whether you’ve been dairy free for years or just a few months, one concern always is what can you have at the dessert table. You want everything, but you know you can’t have everything (unless of course you’re having dinner and everyone is dairy free or vegan – wouldn’t that be amazing?). Thankfully, we’ve done the hard work for you and created the perfect dairy free sweet potato pie. Not to be outdone by our dairy free pumpkin pie (we think you should have both! 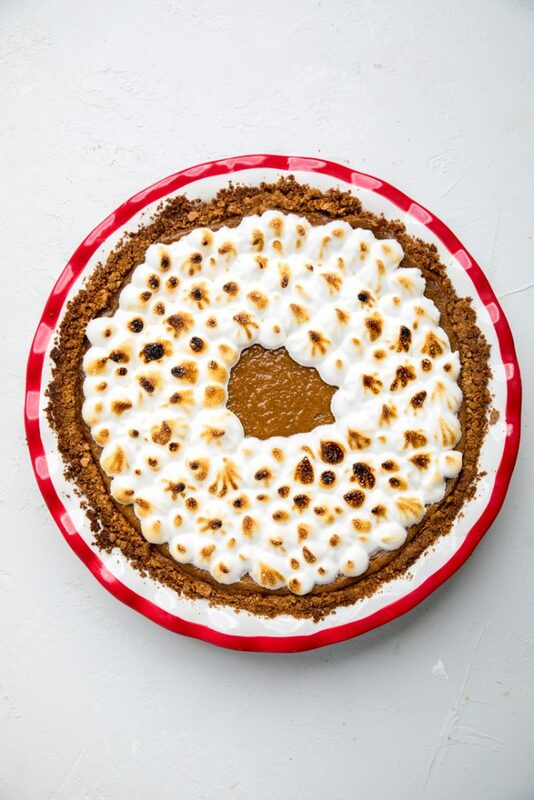 ), but this vegan sweet potato pie is even better. It’s so good you won’t even know you’re missing the other ingredients. We’ve made this a vegan sweet potato pie so that means it’s a dairy free, egg free sweet potato pie. 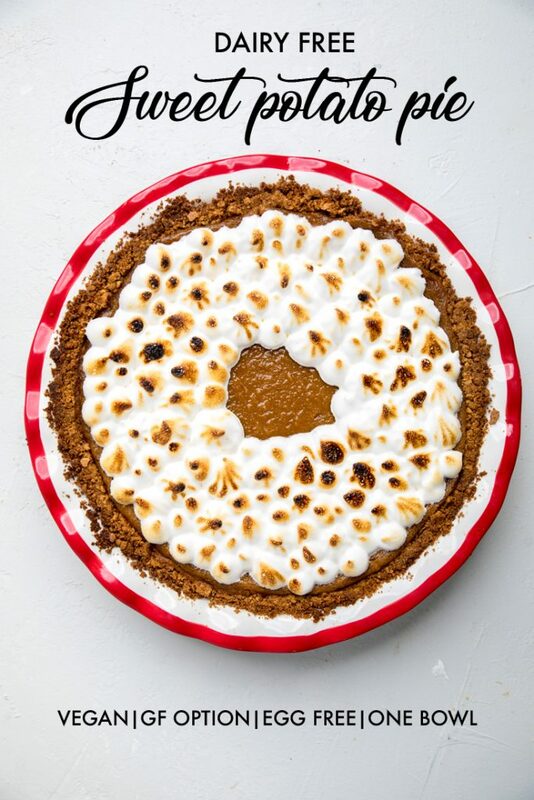 Plus, we’re including an option to make this a gluten free dairy free sweet potato pie. 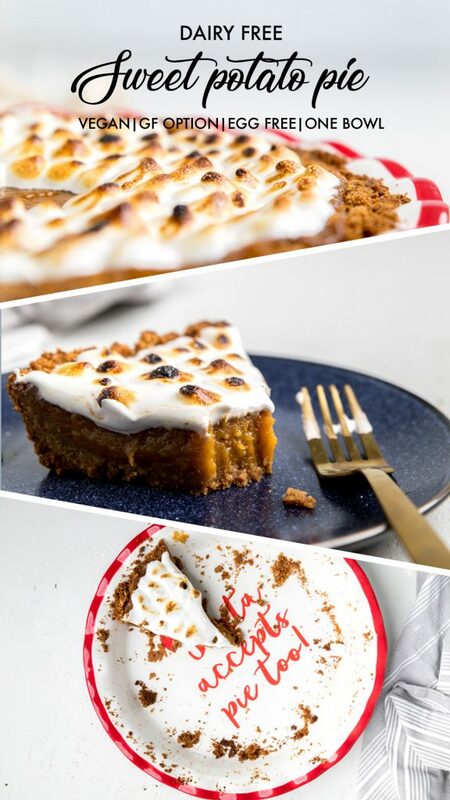 Watch how to make Dairy Free Sweet Potato Pie? 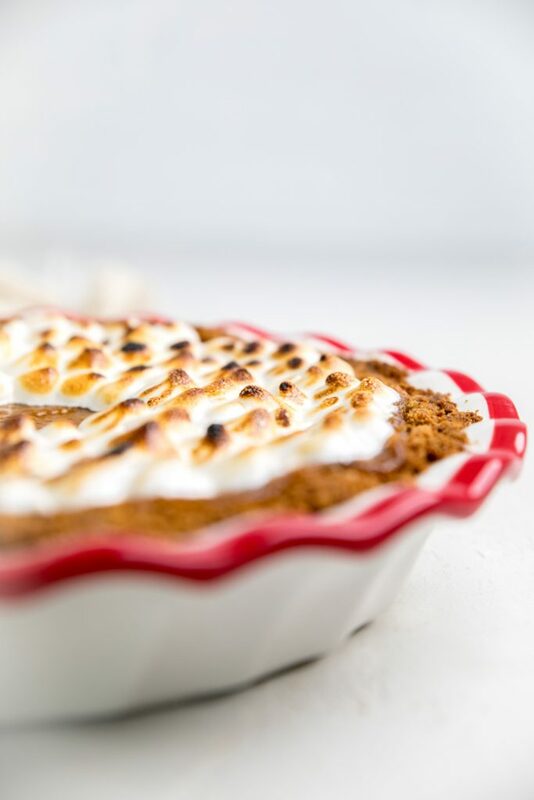 What ingredients do you need to make Dairy Free Sweet Potato Pie? Can I make any substitutions for this vegan sweet potato pie? This dairy free sweet potato pie is based off of this traditional sweet potato pie recipe. The only dairy ingredients are the butter and the milk, so if you are only dairy free, you just need to make those too swaps. Replacing each with a dairy free butter and milk. You are welcome to use any dairy free butter or milk for our dairy free sweet potato pie. We chose almond milk and a soy free vegan butter, but the choice is yours. If you are nut free, a soy, oat or flax milk will work perfectly in recreating this dairy free sweet potato pie. We prefer arrowroot powder over cornstarch, but cornstarch could be swapped if needed. How do you make Dairy Free Sweet Potato Pie? 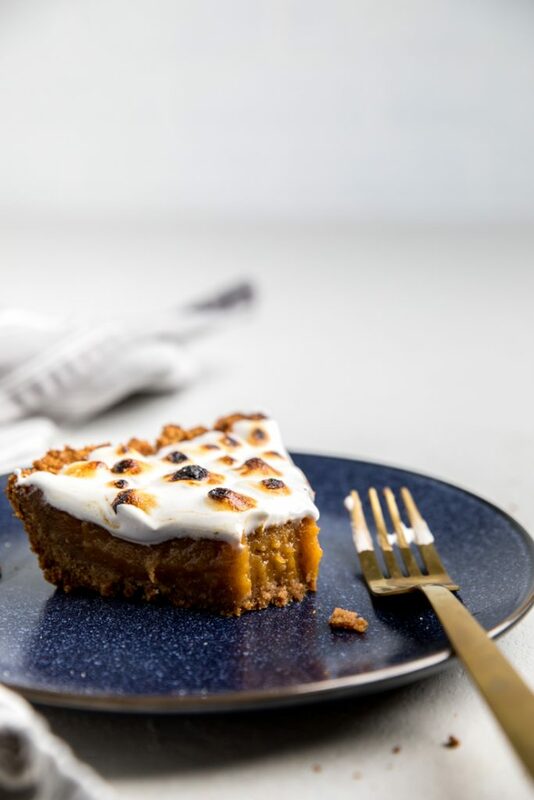 To make this dairy free sweet potato pie recipe, you want to start by boiling your sweet potatoes until they are fork tender (about an hour). While that is boiling, combine graham cracker crumbs with butter and brown sugar. Using the back of a spoon, press mixture down, evenly spreading across and up the sides of your pie dish.. When ready, remove the skins of your sweet potatoes and add to a bowl. Beat on low with a mixer. Add in the remaining pie ingredients and beat until smooth. It’s that easy to make the most delicious dairy free sweet potato pie around. Boil sweet potatoes until they are fork tender (about an 45-60 mins). While that is boiling, make the crust. To make the crust, in a 9 inch pie dish, combined the graham cracker crumbs with the melted butter and brown sugar until well combined. Then press the mixture down with the back of a spoon evenly and up the sides. When sweet potatoes are fork tender, remove the skins of your sweet potatoes and add to a bowl. Beat on low with a mixer. Add in the remaining pie ingredients and beat until smooth. Pour the pie filling mixture into cooled pie crust. Bake for 60-75 minutes. The center should have a non-glossy look. The pie will still jiggle. Set on a cooling rack until room temperature. Place in the fridge to set up for at least 4 hours. (You can make up to 3 days ahead of time). Place aquafaba in a bowl and beat with a mixture until soft peaks have formed (6-8 minutes). Add in the remaining ingredients and beat on high until stiff peaks have formed. Place into a piping bag (use two sizes for a better affect) and carefully pipe topping onto a chilled pie. *Note 2: If you don’t want to pipe then you can carefully spread on top and create swirl design. Place under a broiling for 30-60 seconds watching carefully so not to burn.